Khardung La Pass or Khardungla Top enjoys the coveted distinction of being the World's Highest Motorable Pass, but that title may be disputed. Facts aside, the pass is indeed a feat of human endurance as it is located at an altitude of more than 18,000 ft. 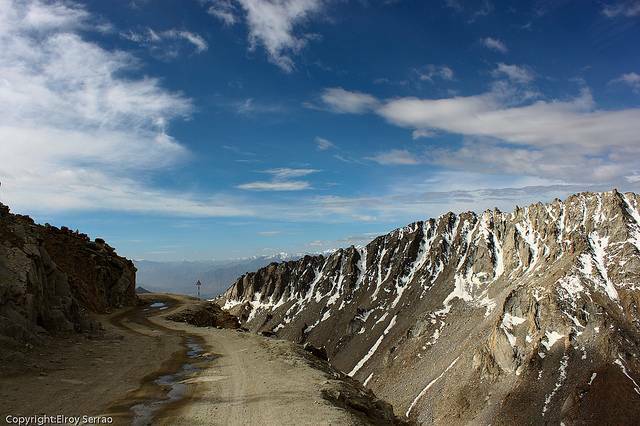 This pass is on the way from Leh to Nubra valley. The oxygen level at this altitude is quite low, so be prepared and do not stay here for more than 15-20 minutes. Permit is no longer required for Indians to visit Khardung La. Traffic is only allowed to move in one direction at a time. From 9AM – 1PM it moves from Leh to Khardung La & from 1PM – 5PM it moves towards Leh. Because of low level of oxygen, avoid halting too long at Khardung La top. There is a cafe here where you can have snacks and tea. This pass remains open from May to late October but sometimes gets closed intermittently due to bad weather.